Sri Lankans had the opportunity of witnessing the speed, power and adrenaline that only an F1 car can bring at the recently concluded Colombo Night Races 2013. Red Bull's rookie driver Daniel Ricciardo who will drive alongside world champion Sebastian Vettel in this year's championship was in the island with the Red Bull racing team and the RB7 to give local racing enthusiasts the look and feel of an F1 engine, the power of the machine on the track and driving techniques that have made Red Bull the championship team for many years. Much planning and logistical detail was put in place to ensure that the Redbull team visited the Galle Fort, the Dutch Hospital Shopping Precinct, Independence Square and the CNR 2013 racetrack. AMW was the transport partner for the Red Bull F1 team during their stay in the island. 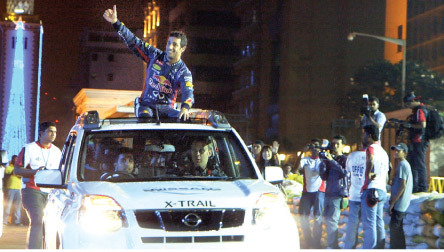 AMW provided transport for the F1 car and luxury conveyance for Daniel and the rest of the Red Bull team as they travelled and met fans at various locations in Sri Lanka. Nissan have had a successful affiliation with the Red Bull F1 team since 2011 as their official van supplier.